Both Democratic and Republican candidates for statewide office in 2014 are pledging to increase resources for the cash-strapped Texas Department of Transportation. New section opening of the Grand Parkway in Katy, Texas, Saturday, December 14, 2013. In a speech last month kicking off her campaign to be Texas' first Democratic lieutenant governor in 15 years, state Sen. Leticia Van de Putte of San Antonio offered examples of what she considered negligence by the state’s Republican leadership. “They’ve even talked about taking paved highways and turning them into gravel roads, as if they think that you can grow a 21st-century economy on a 19th-century transportation system,” Van de Putte said, drawing boos from the crowd at a gymnasium at San Antonio College. “Doesn’t Texas deserve better than that?" While transportation funding does not draw the emotional response of debates over education reform and abortion regulations, it is emerging as an issue in next year’s statewide elections. Both Democratic and Republican candidates have pledged to increase resources for the cash-strapped Texas Department of Transportation. The Texas Legislature primed interest this year by debating different approaches to increasing TxDOT's budget. The agency’s leaders told lawmakers that their annual budget was more than $5 billion short of what was needed to maintain current levels of congestion amid the dual demands of accommodating a growing population and sustaining an oil-drilling boom that has significantly increased truck traffic on some roads. Most of the agency’s current budget of $10.5 billion a year goes to road construction and maintenance. Critics have questioned how well TxDOT has used the money, but complaints have eased with recent cost-cutting. 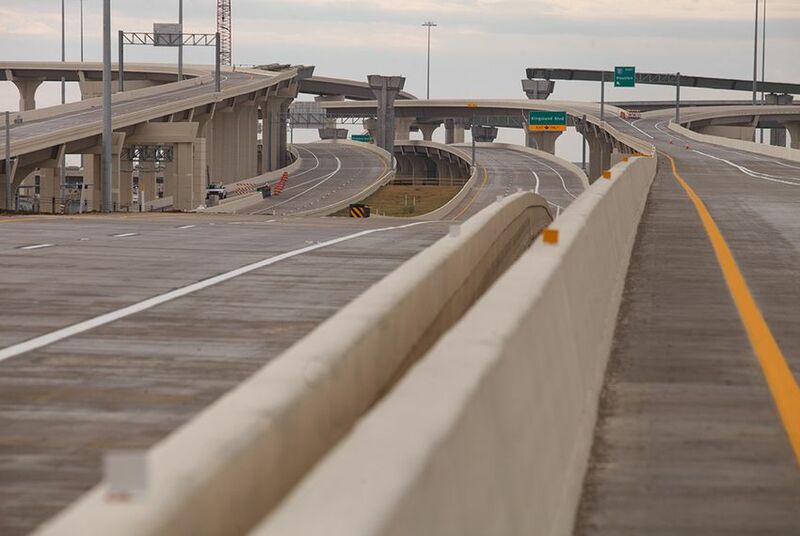 While some continue to complain that the agency puts too much money into toll projects, TxDOT officials counter that toll revenue allows road projects to move forward years earlier than possible otherwise. The partial solution that lawmakers adopted will require voter approval in November, ensuring that transportation funding will be part of the political discussion in the fall. If voters approve, the measure will dedicate some future oil and gas production tax revenue to road projects. The state comptroller recently estimated that the plan would increase funds spent on transportation by more than $1.3 billion a year. To further close the agency’s funding gap, Abbott has called for dedicating the tax now collected on automobile sales to transportation and ending longstanding diversions of gas tax revenue to public schools and law enforcement. State Sen. Wendy Davis, a Fort Worth Democrat and a front-runner for her party's nomination for governor, also favors ending the diversions. A campaign spokeswoman pointed to measures Davis filed in 2011 and 2013 that, had either of them passed, would have discontinued hundreds of millions of dollars in diversions from the highway fund over several years. Besides the funding debate, the absence of Gov. Rick Perry's name on the November ballot could change how candidates broach transportation on the campaign trail. Both in 2006 and 2010, Perry ran for re-election facing questions about the Trans-Texas Corridor, his ambitious yet controversial plan to build a massive statewide network of toll roads and allow a private firm to run it. The transportation department created a new political lightning rod six months ago when it announced plans to convert some badly damaged paved roads to gravel in parts of South and West Texas. Agency officials said that a surge in drilling-related truck traffic had rendered the roads unsafe and that the agency lacked the resources to properly maintain them. The program drew bipartisan criticism. After converting five miles of road in Live Oak County to gravel, the agency shelved the initiative. Nonetheless, Van de Putte and others Democrats are pointing to it as proof that Republicans would rather move backward than invest in infrastructure. At a public event hosted by The Texas Tribune in September, Davis described the gravel roads initiative as a repudiation of the farm-to-market road system that has bolstered the Texas economy for decades.